It’s what gets me through the day when I would despair against the chaotic events unfolding in our national and world affairs. And on the home front as well, as my son faces a vicious custody battle. It’s what boosts my spirits and keeps me on a steady course moving forward. I’m a firm believer in that “the truth will out,” that lies will eventually be exposed and turn against the liar. That “the truth will set you free,” freeing not only the one lied about, but the one who lies as well. I also firmly believe that “love trumps hate,” that it outlasts hate and will win the day in the end. I’ve been heartened to see on the front pages of our news outlets how the truth about those who have committed crimes, whether through political intrigue or money laundering or sexual assault, has come out into the open. Only when lies and secret crimes have been uncovered will justice and healing begin. It bears out Martin Luther King’s claim that “the arc of history is long but it bends toward justice.” Truth wins. Love wins. In the end. But in the middle of the fray, all is gray and murky. When we are in the midst of the battle, feeling attacked, maligned, unjustly persecuted; when our safety and future are threatened; when fear and anger, the desire to retaliate, to hate back, to feel a gleeful satisfaction at another’s downfall, when all this takes over our thoughts, we soon realize that we’re caught up in the same tangled web we’ve sworn to fight against. That’s how lies and hate work, how they turn would-be champions of love into haters themselves. A hater of the haters. Allowing these feelings go unchallenged perpetuates the very thing we would fight against. It divides the world into us and them, and no matter which side we stand on in that battle, we are all losers. We have to watch our thoughts and guard our hearts so carefully, if we would not be pulled inside out and find that we are fighting on the side of hate ourselves, against those we feel have done us wrong or hurt our loved ones. We all know this. But it’s hard not to hate the haters. What could we possibly find to love in them? I found something that helps me with this. I was told: “You don’t have to love them. You just have to love. You watch your thought and guard your heart so only love enters. In that frame of mind, feeling compassion for the hater comes naturally. How could we not feel compassion for someone who seems so helpless to fight against a hatred that hurts them far more than the one it’s directed against? In that frame of mind, I can turn that gleeful sense of self-righteousness into simply gratitude for good. Gratitude for the fact that the lie is exposed, the crime revealed, justice is done, and now reformation and healing can take place. What I’m learning is that the warfare with “evil” as we see it is not really fought on the outside with the other. It’s all on the inside, with ourselves, our own thoughts, our own hearts. That’s where the battle against hate and deceit is fought and won. It sounds simplistic and idealistic until we actually try to do it. Then we discover it’s the most difficult war we will ever have to wage, right in our own hearts. Well said! Thank you for the perspective that we do not need to love them. We simply need to love. Thank you, Catherine, and you’re welcome. That perspective helped me tremendously and I’m glad of the opportunity to pass it on. Thanking you and The Bard for this timely and timeless reminder. I love it! Thank you so much for sharing this sonnet. The Bard’s wisdom shines through so much of his work and is indeed timeless. Nicely put Deborah! As the rain comes down and I am tucked into the gallery for a few more hours with visitors coming wandering in as they take in the studio tour, It is good to think about your words and how our actions can support them. Thank you, Terrill. It sounds lovely where you are. Wish I could visit. That means so much to me, Joy. Thank you. Wisdom from and for the ages. Nicely put! Nicely done. So glad to see you here again, Ken. It never gets old, does it, these lessons. Exactly! As long as we keep learning. It’s all an internal battle. Win that one, and there will be no more external wars. As someone wisely put it: Look to this day. Look to your heart. Deborah, this post is timely and so well written. Thank you for reminding us of MLK’s words, and how we need to be in this for the long game. Here in Virginia, we were lucky to have a thrilling election day. If you need to see some happy folks, pop over and take a look. As for your son, I will hope that the truth will indeed be revealed, and all will work out. Thank you so much! I am hopeful things will work out for all of us. 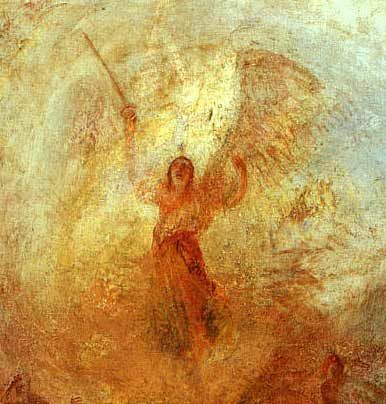 The light in the Turner painting drew me in and your good message carried me through. To truth and love. I love that painting too. I don’t think I could have found a more perfect image to go with what I was trying to convey. Thank you for coming here and sharing your thoughts. This is the TRUTH, Love always wins.